A classroom is a destination kids should look forward to. With that in mind, BenQ Education Projectors empower kids to lead the way and we all learn through the teaching process. With a high brightness of 3300 ANSI Lumens the BenQ MW883UST can deliver brighter, clearer, sharper text and graphics, even in large-size classrooms with some ambient light. BenQ’s expanded line of education projectors includes an impressive selection of Ultra Short throw models – achieving a 100-inch diagonal image from as little as 3.14” from the screen, creating an ideal teaching environment with no harsh light shining in the teacher’s eyes. Place ultra short throw projectors as close as 3.14” from the screen so teachers can walk freely in front of the board without blocking the projection, creating fewer distractions from learning. The next-generation optical engine in the BenQ MW883UST works with DLP chip technology to provide precise readability, sharply defined contrast ratio and crisp resolution. The BenQ MW883UST features the latest Total Internal Reflection (TIR) prism technology to deliver unmatched brightness and color uniformity. 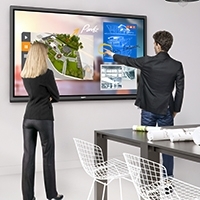 BenQ’s exclusive PointWrite™ with QWrite interactive software enables teachers and students to easily interact with and annotate class material to create a fun, collaborative learning environment. With QWrite teachers can capture and save lessons as they are being presented so that students can be more fully involved in the class and get the exact notes as they appeared on the board. PointWrite™ works on virtually any flat surface – teachers can easily turn a table or a desk into a multi-touch interactive screen for students to explore and interact with class material. Adding PointWrite functionality is fast and easy, requiring just a few simple steps to complete. A quick system auto-calibration is all that is needed once the camera and USB connections have been made and the projector is ready to go. PointWrite projectors support interactive input from up to 4 students simultaneously, fostering team learning, where students assist other students overcome challenges. Two PointWrite projectors can be combined in a side-by-side configuration to create a larger desktop, enabling teachers to display and teach complex subjects with greater ease using BenQ’s exclusive Qwrite software. BenQ projectors allow the use of standard windows gestures to navigate, zoom and scroll on webpages and applications, Supporting all current versions of Windows multi-touch gestures and commands. BenQ Education Projectors incorporate many presentation-friendly features, including a compact dongle that allows users to stream documents, images and videos from a smartphone or computer to the big screen. Connect a classroom PC, notebook or mobile device to a projector for high-definition video via Wi-Fi. Eliminate messy cable connections by simply using a BenQ wireless dongle. BenQ makes perfect projector installations easy, providing installation templates to help installers determine the precise installation location relative to the screen. Once wall mounted, BenQ Ultra Short Throw projector mounts help complete the job, allowing installers to easily align and true the image by turning just 3 knobs at the front of the mount. Making the installation as easy as 123 . Useful when projecting at a slight angle or on uneven spaces, this flexible and convenient feature corrects image geometry by adjusting each corner of an image independently. Featured on selected BenQ Education Projectors, surface Fit Geometric Correction is designed to support projection on non-standard surfaces such as concave or convex screens or walls, opening up a much greater number of projection possibilities. The “Quick Install” hotkey on the remote control provides instant access to commonly used setup features such as test pattern and keystone correction. This is a great time saver, useful even when performing routine checks. LAN Control helps IT personnel remotely perform day-to-day projector management and control operations over their networks – Provides full LAN access and control over every projector. The LAN display function allows school officials to broadcast messages to up to 255 projectors simultaneously to effectively communicate alert messages to every classroom. Incorporating BenQ’s renowned SmartEco lamp saving Technology, the MW883UST not only offers greater energy savings, but continues to deliver amazing picture quality through this innovative technology. SmartEco mode is designed to use only the exact amount of lamp power the projector needs to deliver the best contrast and brightness performance. This feature enables the MW883UST to deliver uncompromised projection quality with the added benefit of reduced the total cost of ownership by extending the lamp life and lowering power consumption. *SmartEcoTM Mode, dynamic power saving mode, can save up to 70% power, depending on the content being displayed. DLP Technology also includes a filter-free engine design for carefree confidence in long-lasting image quality and reduced TCO. 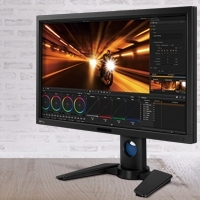 BenQ’s SmartEco™ Technology further boosts contrast performance and image quality endurance while saving up to 70% on lamp power consumption. Enabling a 96% fill factor, DLP Technology supplies pixel circuitry behind the pixel, thereby eliminating the thick dark bezels around individual pixels, which diminishes color and detail. A higher fill factor and less black border translate into noticeably purer, more intense color and smoother image quality. 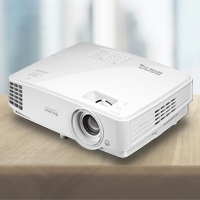 BenQ DLP Projectors also feature high contrast ratios for flawless rendering of small text, fine lines, and dark scene details. Blacks are deeper and overall image quality is more focused and clean. Your presentations will be easily readable and highly effective, even from the back row of a well-lit room.